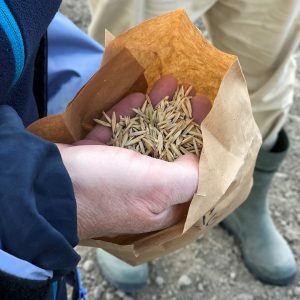 2019-04-12: Can perennial grains help solve the many environmental and social problems faced in modern agriculture? Welcome to sign up for this half-day symposium at Lund University, co-sponsored by Axfoundation. The symposium puts the limelight on the future of agriculture together with prominent scholars from the humanities, natural, and social & economic sciences. Among the topics are Why we need to reinvent agriculture, and Is the future of agriculture perennial – ecological principles, potentials and pitfalls. Of special interest is also A tale of two grains—Kernza and perennial rice. In the last couple of years perennial grains have started to rapidly attract interest from farmers and industry, not least the perennial rice (PR23) and the proto-domesticated perennial species intermediate wheat grass (“Kernza”). The time is ripe for bringing research and progressive producers together. Therefore, in the beginning of May, over 80 specially invited researchers from around the world will meet in Lund to present and discuss progress, challenges and future avenues regarding the development and upscaling of perennial agriculture. Among those participating is Anna Westerbergh, Associate Professor of Genetics and Plant Processing at the Department of Plant Biology at SLU in Uppsala. Since 2018, SLU has run a major attempt to improve Kernza for Swedish conditions at Torsåker farm in collaboration with Axfoundation. See an interview with the principal researcher Anna Westerbergh on how perennial crops can reduce the agriculture impact on the environment and the climate. The ambitions is that this conference will become a stepping stone for integrated research in which academia and producers start co-producing knowledge. Hence the conference will comprise sessions in which participants representing producers, food industry, and policy, will discuss potentials and challenges of perennial polycultures.